Hemingway is known for so many off-the-page details (his drinking, suicide, cats, crankiness) that sometimes his amazing works of literature get lost in the myth. Sure, most lists of classic books feature at least one of his titles, but as a body of work they hold more significance. After all, his topics vary tremendously, and the way he handles his characters is never the same. So the opportunity to review the book, Ernest Hemingway and the Geography of Memory, appealed to me. 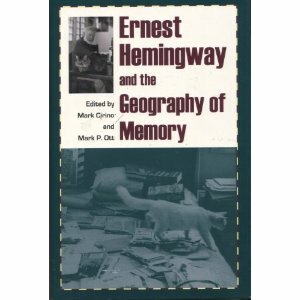 I genuinely wondered what the phrase "geography of memory" would mean. This is an amazingly in-depth, heavily detailed, and annotated exploration of Hemingway and the way his books related to places and things. It's not a biography, or simply an exploration of what his books meant. Rather, the focus is on both how he created them and the influence of his writing on others. This would be an ideal read for someone familiar with most of his collection. In this review, I want to comment on two of the most fascinating chapters in the book. One is "Memory and Desire-Eliotic Consciousness in Early Hemingway", a persuasive essay by Matthew J. Bolton, which is a revealing look at the relationship between Hemingway, Ezra Pound, and TS Eliot (thus "eliotic"). Pound was the editor for TS Eliot on the book The Waste Land, and soon after became editor to Hemingway. Hemingway in many respects appears like a jealous little brother of Eliot: he made snarky remarks every chance he had, and yet appeared to respect Eliot's work. According to the book, Hemingway used The Waste Land as a model "for incorporating the remembered word or image into the fabric of the story and for using the processes of memory...as a structuring principle for layering a series of scenes and stories outside the normal scheme of narration (37)." The chapter explains what this means in terms of writing: a word or phrase from another source (such as the poet Marvell) is subtly fused into the story, and then the author revisits it again in a later section. It adds a depth and authority to the newer work. My favorite of Hemingway is The Sun Also Rises. I was incredibly confused by the huge amounts of alcohol found in the story: how did these people function on so much booze? Obviously, by continuing on with the book, I realized that they didn't do much, the drinking was their medicine to cope with the horrors of war. In the book, much is made of each bar and restaurant that Jacob Barnes visits in Paris. He makes sitting in a bar getting wasted appear to be an intellectual exercise. In any case, until I read this book, I didn't realize that the sites he mentions actually became a road map for wannabe "artists" and tourists who went to Paris hoping to fit right in. In the chapter, "Expatriate Lifestyle as Tourist Destination: The Sun Also Rises and Experiential Travelogues of the Twenties", Allyson Nadia Field explores the tourism that resulted from Hemingway's book. Some entrepreneurs created maps of the places in the book, encouraging visitors to visit and live that 'authentic' Parisian lifestyle as romanticized by Jacob and his friends. And yet, before Hemingway's book was even released, many travelogues were already creating a tourism based on the mysterious hipness of the starving artist and intellectual. After The Sun Also Rises was published, the area simply exploded with visitors bent on reenacting the lifestyle, yet finding themselves, by definition, clearly not fitting in. You can almost imagine Hemingway's sneer at the type of people that would make the journey and spend the money to be like him and his friends. In fact, the essay explores how many people were disappointed that the Paris they visited was so unlike the book. It's really sort of ironic that the people who would go to such an effort didn't spend the effort in actually reading the book, in order to understand that the Paris life it revealed was not happy at all. This is a collection that examines each of Hemingway's books in the framework of society and time. Each essay reveals connections between people on the periphery of Hemingway's life as well as inspiration for the scenes and narrative. This is not a simple read, or lightweight in any way. It would actually be suitable as a textbook or research on Hemingway. Special thanks to Kent State University Press for the Review Copy. This sounds absolutely fascinating. I'm going to add it to my amazon wish list. Thank you so much for your great review. Wow, this sounds really interesting. I've found some of Hemingway inpenetrable, especially his characterizations of women, but maybe this would help!